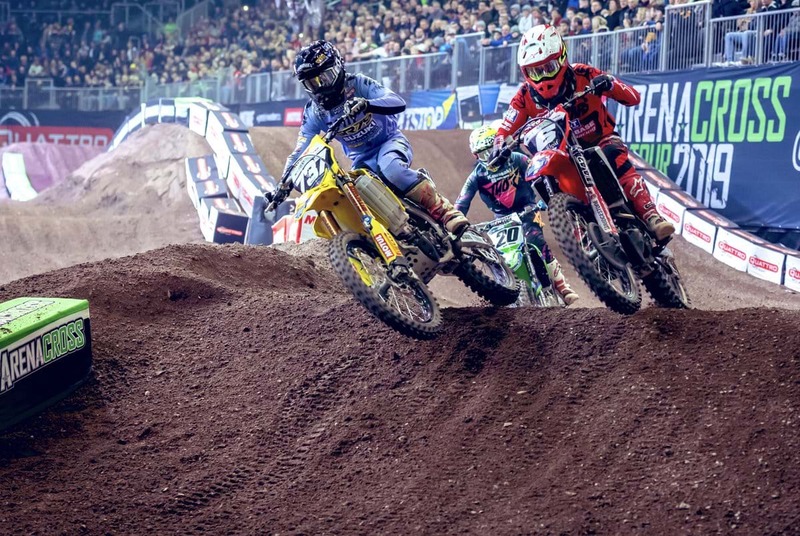 The SR75 World Suzuki team notched up more Arenacross podiums at the weekend, with back-to-back nights of action at Birmingham’s Resorts World arena. The three-time Pro Championship-winning team picked up eight podiums and a win for Valentin Teillet on the all-new RM-Z250, with both Teillet and Charles LeFrancois holding second in both the 250 and 450 championship standings. On night one and round three of the championship Teillet finished second twice in the two 250 races, while LeFrancois grabbed a third and a second in the two 450 events. However, the event’s SuperFinal format - which sees the top points-scorers in both 250 and 450 races combine with 250 riders getting first gate pick - hindered LeFrancois as he tried to cut through the pack. The chequered flag dropped with Teillet fourth after holding third for much of the race, with LeFrancois fifth. The second night of action saw Teillet, who has been finding more and more speed each time the gate drops, race his RM-Z250 to victory in the opening 250 race. He then finished runner-up in the second 250 moto, while LeFrancois bagged two second placed finishes in the 450 races. In the night’s main event Teillet raced his SR75 World Team Suzuki RM-Z250 to another podium finish, taking third at the chequered flag, just ahead of his teammate, LeFrancois. The Arenacross series heads to Sheffield on February 15-16 for the final two nights of action.